The markets are closed Monday in observance of Martin Luther King Jr. Day. Then, housing reports are front and center the rest of the week. On Tuesday, the National Association of Home Builders Housing Market Index for January will be released. More housing numbers from December follow. Look for Housing Starts and Building Permits on Wednesday, and Existing Home Sales on Friday. Weekly Initial Jobless Claims will be delivered on Thursday, as usual. 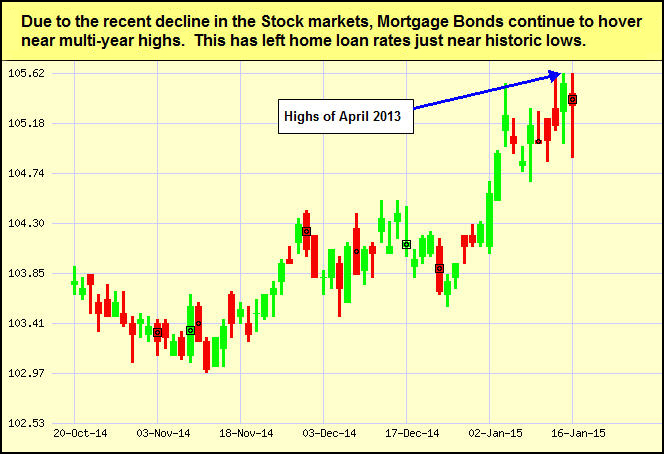 As you can see in the chart below, Mortgage Bonds remain near multi-year highs, helping home loan rates hover near record lows. This Is Your Life. This weekly podcast featuring author and blogger Michael Hyatt, the former Chairman and CEO of Thomas Nelson Publishers, is consistently ranked in the top ten in iTunes’ Business category. The goal is to help listeners lead with intention, live passionately, and develop greater focus in life and business. Social Media Marketing. Social Media Examiner’s Michael Stelzner interviews leading social media marketing pros. You’ll learn how to better leverage social media, hear about new strategies and tactics, and quickly improve your social media marketing skills. 48 Days to the Work You Love. Author and motivational speaker Dan Miller is the nation’s leading authority on work, career and business acceleration. Learn more about finding yourself in your career and who you are called to be in relation to your vocation. This show is often number one under Career podcasts. Beyond the To-Do List. Hosts discuss the real goal of productivity: planning for and living a meaningful life. Learn from the success and failure of other masters of the art of productivity, and get inspired to move ahead. Dose of Leadership. Coach, speaker and podcaster Richard Rierson brings in authors, educators, entrepreneurs, CEOs, and other leaders from all walks of life to discuss their trials and breakthroughs. You’ll discover down-to-earth tips for becoming a better leader and promoting positive change in your world. Please feel free to pass these great success podcasts along to your team, clients and colleagues!